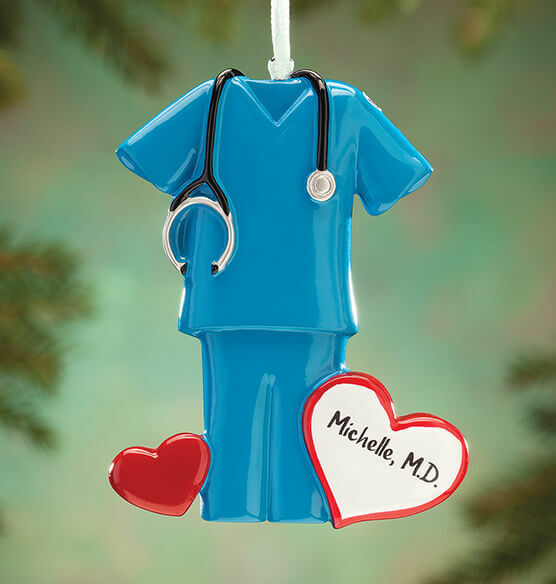 For that hardworking hero who looks great in blue, this Personalized Blue Scrubs Ornament offers a personalized shout-out! Honoring one doctor, nurse, PA or CNA who's earned a special place in your heart, this custom ornament is a great way to show your appreciation or offer congratulations on med school acceptance, graduation or any accomplishment. We'll add one name to the big white heart—creating a custom keepsake. Specify name. Granddaughter is a cna. Would have liked to have tan scrubs, but I will paint myself.